Driverless AI can deploy the MOJO scoring pipeline for you to test and/or to integrate into a final product. This section describes how to deploy a MOJO scoring pipeline and assumes that a MOJO scoring pipeline exists. Refer to the Driverless AI MOJO Scoring Pipeline section for information on how to build a MOJO scoring pipeline. This is an early feature that will eventually support multiple different deployments. At this point, Driverless AI can only deploy the trained MOJO scoring pipeline as an AWS Lambda Function, i.e., a server-less scorer running in Amazon Cloud and charged by the actual usage. All of the MOJO scoring pipeline deployments are available in the Deployments Overview page, which is available from the top menu. This page lists all active deployments and the information needed to access the respective endpoints. In addition, it allows you to stop any deployments that are no longer needed. Driverless AI MOJO Scoring Pipeline: To deploy a MOJO scoring pipeline as an AWS lambda function, the MOJO pipeline archive has to be created first by choosing the Build MOJO Scoring Pipeline option on the completed experiment page. Refer to the Driverless AI MOJO Scoring Pipeline section for information on how to build a MOJO scoring pipeline. Terraform: In addition, the Terrafrom tool (https://www.terraform.io/) has to be installed on the system running Driverless AI. The tool is included in the Driverless AI Docker images but not in native install packages. To install Terraform, please follow steps on Terraform installation page. Note: Terraform is not available on every platform. In particular, there is no Power build, so AWS Lambda Deployment is currently not supported on Power installations of Driverless AI. Usage plans must be enabled in the target AWS region in order for API keys to work when accessing the AWS Lambda via its REST API. Refer to https://aws.amazon.com/blogs/aws/new-usage-plans-for-amazon-api-gateway/ for more information. The following AWS access permissions need to be provided to the role in order for Driverless AI Lambda deployment to succeed. Once the MOJO pipeline archive is ready, Driverless AI provides a Deploy option on the completed experiment page. This button is only available after the MOJO Scoring Pipeline has been built. This button is not available on PPC64LE environments. This option opens a new dialog for setting the AWS account credentials (or use those supplied in the Driverless AI configuration file or environment variables), AWS region, and the desired deployment name (which must be unique per Driverless AI user and AWS account used). Deployment Name: A unique name of the deployment. By default, Driverless AI offers a name based on the name of the experiment and the deployment type. This has to be unique both for Driverless AI user and the AWS account used. Use AWS environment variables: If enabled, the AWS credentials are taken from the Driverless AI configuration file (see records deployment_aws_access_key_id and deployment_aws_secret_access_key) or environment variables (DRIVERLESS_AI_DEPLOYMENT_AWS_ACCESS_KEY_ID and DRIVERLESS_AI_DEPLOYMENT_AWS_SECRET_ACCESS_KEY). This would usually be entered by the Driverless AI installation administrator. AWS Access Key ID and AWS Secret Access Key: Credentials to access the AWS account. This pair of secrets identifies the AWS user and the account and can be obtained from the AWS account console. 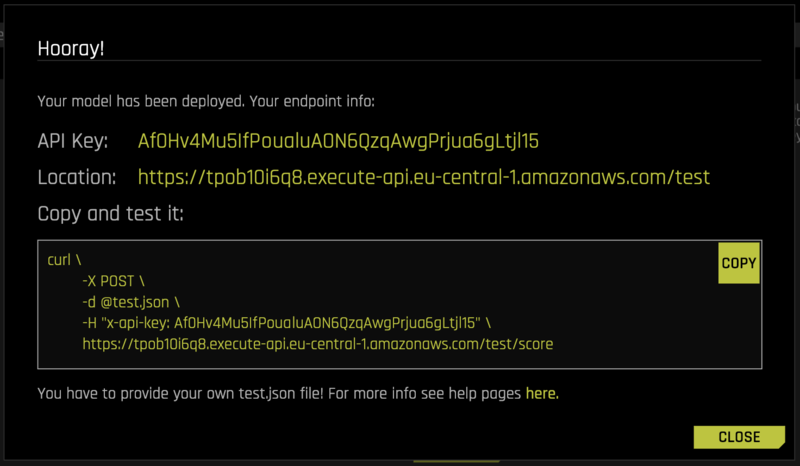 On a successful deployment, all the information needed to access the new endpoint (URL and an API Key) is printed, and the same information is available in the Deployments Overview Page after clicking on the deployment row. Note that the actual scoring endpoint is located at the path /score. In addition, to prevent DDoS and other malicious activities, the resulting AWS lambda is protected by an API Key, i.e., a secret that has to be passed in as a part of the request using the x-api-key HTTP header. fields: A list of input column names that should correspond to the training data columns. rows: A list of rows that are in turn lists of cell values to predict the target values for. optional includeFieldsInOutput: A list of input columns that should be included in the output. The response is a JSON object with a single attribute score, which contains the list of rows with the optional copied input values and the predictions. A single shared S3 bucket per-region is used for AWS Lambda deployment. This behavior currently only works with the us-east-1 region. Other regions may fail with a “BucketAlreadyOwnedByYou” message.